With this pattern you can make a Mommy cat and a whole bunch of cute little kittens for her to love. 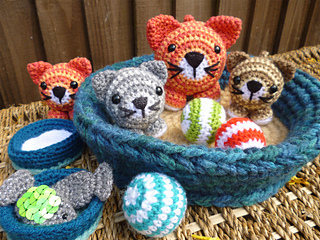 Pattern also includes instructions to make their basket, feeding bowls (with milk and a tasty fish) and a little ball to keep the babies amused. Detailed instructions and clear photographs make it easy for you to create these sweet kitty characters. Cats, Kittens and small accessories are worked in light worsted weight (DK/8 ply) yarns with a size D/3 (3.25mm) crochet hook. Basket is worked in super bulky weight yarn and a size L (8mm) crochet hook. 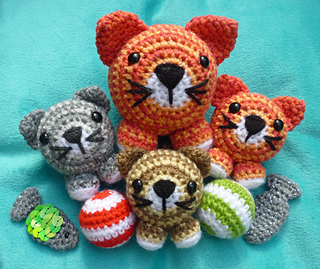 With hook and yarn specified above Mommy cat measures 4” tall and kittens are 3” tall.